Standees, as their name implies, are graphics made to “stand up” on their own. They can utilize several different methods to prop itself up into customer view, including an anchored base, separately attached feet, or an applied easel. The printed face of the standee is typically made of Coroplast, cardboard or foam board. Movie theater promotions: Cinemas are home to many advertising products, including posters and translite graphics. Standees are often used to create life-size versions of popular characters from upcoming blockbusters. Consumer product displays: Companies deploying new items or promotional offers can use standees to enjoy distinguished advertising. Since they often stand directly next to consumer traffic, this display is eye-catching and will capture a shopper’s attention. Celebrity endorsements: Celebrities can endorse many products but it is difficult for any of them to be in more than one place at a time. Creating a life-size standee of a famous celebrity can share that endorsement across multiple locations simultaneously. Children-focused marketing: Standees can be used as elaborate frames around certain displays. Many fast food chains have used standees to highlight promotional items, such as toys. Event promotion: Given the general large size of standees, this class of graphic display is well-suited for alerting customers of an upcoming event or promotion. The largest standee is roughly 10 feet tall – a giant that can be seen from anywhere in a crowd. Social media opportunity: Certain consumers love taking pictures with standees, especially if the graphic display resembles something topical or popular. Brands can use this signage to present new products or marketing slogans, helping to generate new leads without constant active effort. 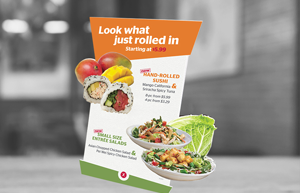 Restaurants: Small self standing signage is desired for table tops at restaurants and bars and standees often fit the demand. Standees are an economical option to promote drink or food specials. Standees are a flexible form of signage, ranging from around six inches tall to over 10 feet. The larger the sign, the more important the construction. Standees are designed primarily for indoor use. While more elaborate displays can be fitted with lights and electronics, the average standee is less effective in low-light areas. Standees positioned outside shall be secured down to avoid small gusts of wind from tipping them over and causing damage. Standees constructed of cardboard or foam board are good options for very temporary indoor applications. While they may be sturdy, these standees are delicate and are prone to damage by minor mishandling or consumers touching them. Standees made of Coroplast are equally light weight and much more durable since it is made of plastic. Standees represent a light weight, simple vertical standing graphic display. Even the larger products can be easily picked up and moved and there are no wires to speak of, at least with simpler models. This makes standees a versatile form of indoor signage. As with any other kind of signage, quality matters. NGS Printing has the right equipment to create professional grade standees. Our max sheet size for printing on all material types is 63”x125.” NGS Printing also possesses one of the few wide format digital Inca Onset X printers, which can create standees with high image quality at unbelievable speeds. Our standees can be customized into whatever shape the client desires. At NGS Printing, we pride ourselves at having both the dedicated personnel and the quality machines to deliver a superior product in the agreed upon time. Contact NGS Printing today for your standee needs.